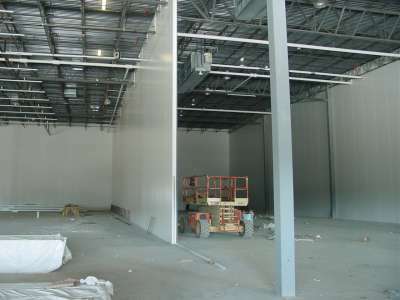 Coolstructures Structural Insulated Metal Panels can be effectively utilized to partition off rooms within an existing structure - creating the ability to have separate yet efficient environmental controls for different rooms. Coolstructures composite wall panels are incredibly strong, lightweight and easy to install. And nothing comes close to matching Coolstructures’s energy-saving properties. Over the past 20 years, Coolstructures has developed an advanced insulated building panel system with high “R” values which do not deteriorate over time. These architectural STRUCTURAL INSULATED PANELS SYSTEMS offer unsurpassed thermal efficiency, they are easy to install and offer the lowest cost per “R”of any similar panel product. With Coolstructures panel products you save $ today and tomorrow. Coolstructure's panels are a snap to install, using a simple "tongue-and-groove" design than reduces thermal bridging(heat loss), so prevalent in more complex designs. Panels simply slide into place and are easily secured to the building’s steel superstructure. In fact, Coolstructures Architectural Insulated Panels are so strong and secure, they actually enhance the strength and rigidity of the structure. Simply choose your “Exterior Skin” type and “Interior Core” materials to fit your specific job, and will help you custom tailor your building envelop package.